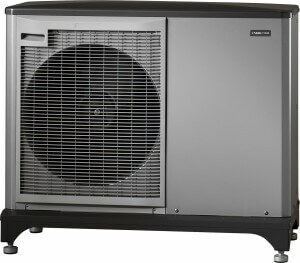 Thanks to the Domestic RHI, air source heat pumps (ASHPs) are becoming increasingly popular. The scheme is a great incentive for homeowners, encouraging them to opt for renewable technologies. It’s also good news for installers who can expect more renewables business. So, what exactly is an ASHP and how does it work? ASHPs, sometimes known as air-to-water systems, work by using warmth extracted from the air. This low temperature warmth is absorbed by a fluid held in the ASHP which passes through a compressor where its temperature is increased before being made available for the heating and domestic hot water circuits of the property. An ASHP can operate in temperatures as low as -20˚C. An ASHP essentially offers ‘free’ energy. It delivers more heat energy than the electrical energy it takes to operate. As a comparison, if an electric fire uses 1 kWh of electricity, it delivers 1 kWh of heat, meaning its ‘Coefficient of Performance’, or CoP, is 1. This means that the electric fire is 100% efficient. If 1 kWh of electricity is put into an ASHP, it could deliver 3 kWh of heat, giving it a CoP of 3. The heat pump has extracted an extra 2 kWh of ‘free’ heat from the air and delivered it for use in heating and domestic hot water. It’s this ‘free’ energy that makes an ASHP attractive, especially to anyone who cannot access gas as they have the most to gain. An ASHP reaches its highest levels of efficiency when producing low flow temperatures. It’s the lower flow temperatures required by underfloor heating that make it the perfect partner for ASHPs. By integrating the two systems together, both technologies play to their strength and maximum efficiency can be achieved without compromising comfort. The Government recognises that ASHPs have a part to play in making UK housing more energy-efficient and reducing energy bills, which is why they have been included in the RHI. To help offset the cost of installing an ASHP, a homeowner can expect a tariff rate of 7.3p/kWh. A typical home using around 20,000kWh per annum of heating requirement could get around £7000 in payments over a seven year period – a considerable amount to go alongside the savings on energy bills. Visit Ofgem to find out more. Who can install an ASHP? The majority of heating engineers could install an ASHP with a clear manual to follow. It’s important to remember that in order to qualify for the Domestic RHI, both the system and the installer has to be MCS approved. Nu-Heat offers support packages to both MCS and non-MCS installers – give us a call for more info on 01404 549770.